"Born on date" concept, celebrating the first moon landing. U.S.A., U.S.A.!!! "Remember Our Name” campaign inspired by Breaking Bad chemical equation design, resulting in explosive content! "Bud Light Showers” celebrated artist Rene Magritte’s birthday with an homage his Golconda painting. Some risqué wordplay here with "I had six with the Bridesmaid." This "Big Sipper" post proves that even constellations can make you thirsty. "Oh, behave!" social post for the "twist me, I like it" bottle cap campaign. Bud Light’s Music First launched 50/50/1, a unique live music event which presented one concert in each state nationwide on a single day. 50/50/1 featured an eclectic lineup of artists from around the globe. Users were encouraged to unlock secret content by following key instructions. A Facebook like, a tweet or a photo uploaded unlocked exclusive content such as a Skype call with Justin Timberlake, a digital autograph, and more. 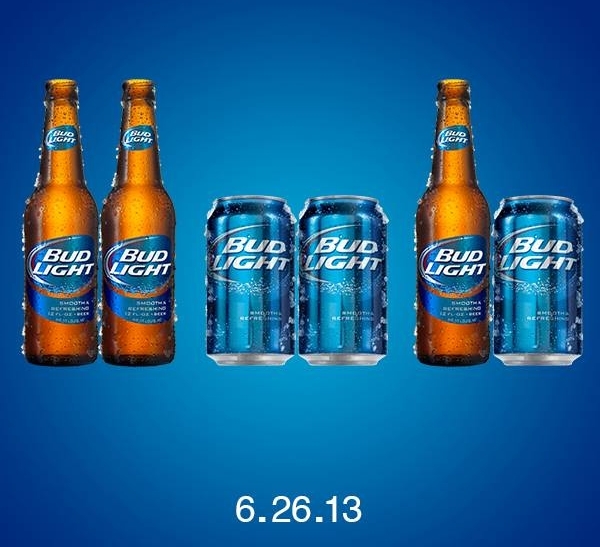 My creative partner and I led social media marketing design for Bud Light at Translation LLC ad agency. We are firm believers in our abilities related to being the best marketers and the best storytellers. The best storytellers use the best data. Across every industry, leading companies have begun to fully leverage the value of building a strong social component within virtually any campaign. Anheuser-Busch, in conjunction with Translation LLC, incorporated social into every part of their launch campaign for Bud Light, measuring each step along the way with Simply Measured’s suite of social analytics tools. This strategy resulted in the most successful US alcohol launch since 2005, and paved the way for Bud Light to continue growing today on social media platforms. Bud Light celebrated historic victories for marriage equality on Facebook that my creative team was able to concept, strategies and design. Many brands adopted the Human Rights Campaign's iconic red equals signs symbolizing gay marriage. We did our own interpretation of the symbol made out of two beer cans.